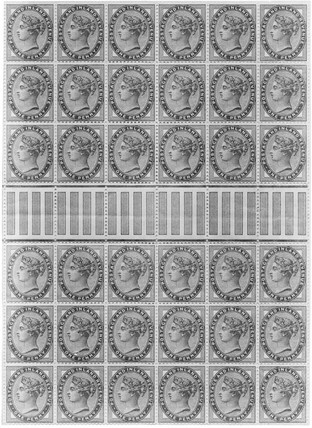 A sheet of penny lilac postage stamps of Queen Victoria's reign. August Wilhelm Hofmann's violet was the dye used in the penny lilac. Pocket clinometer and square in an embosed leather case, c 1675-1700. 'British Railways Locomotives', BR poster, c 1960. Thomas Earnshaw, British horologist, 1798. Christiaan Huygens in Salomon Coster's clockmaker's shop, 1657. 'Double' barometer and thermometer, c 1740. S C Tisley's compound pendulum, 1876.